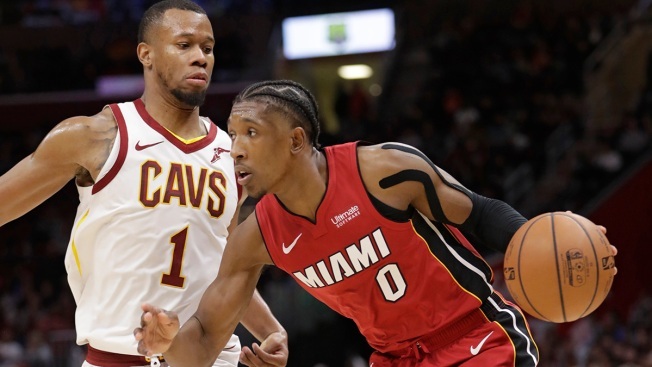 Miami Heat's Josh Richardson (0) drives past Cleveland Cavaliers' Rodney Hood (1) in the second half of an NBA basketball game, Jan. 25, 2019, in Cleveland. Wade played in 46 games with the Cavaliers last season. He was traded to Miami in February. Wade exchanged jerseys with Sexton following the game. Cavaliers coach Larry Drew hopes All-Star Kevin Love, who has played in only four games because of a foot injury, will return soon. Drew was impressed with Love's work during offensive drills in Friday's shoot-around.